Students which participated in Silver Oak's test prep programs current four-year average increase on the SAT is 196 points! At Silver Oak Learning Centers, our individualized test prep programs focus on both aspects of the test-taking process: the core skills needed and the appropriate strategies specific to your child. Your child begins by taking a certified, released test here at the center, which we then grade and analyze. As a family, you then meet with one of our test prep experts to review results and discuss your child’s college choices. Based on the results of the sample test, a customized program is designed for your child so that he/she may reach his/her fullest potential when taking the official test AND vastly increase the likelihood of acceptance at the school of his/her choice. While reviewing the test your child took, in-depth questions will be asked of your child’s grades and study habits. The answers will help us build the most appropriate individualized program specifically for your child. The skills and strategies your child will learn during the test prep program will not only improve test scores, but will better prepare your child for long-term college success. 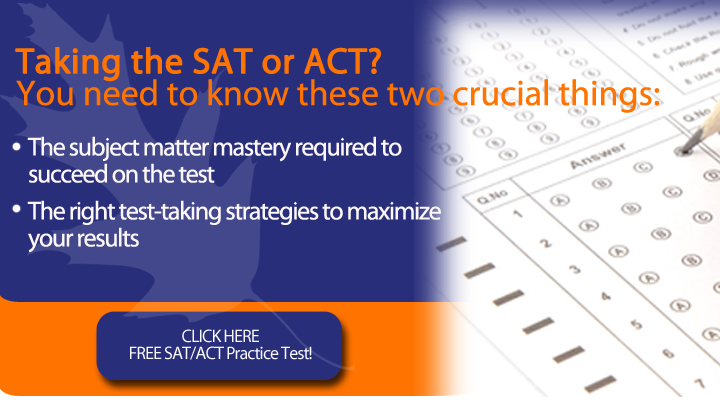 Click below to sign up for a FREE SAT/ACT practice test!